Alcohol has long played a powerful role in business culture: While the era of deals sealed over boozy meals may be fading, drinking remains a fixture of many work environments. Perhaps modern professionals rarely pour drinks for their colleagues at meetings, but alcohol is often part of the bonding they do once the workday is done. Employer-sponsored happy hours can be an important perk for young workers, many of whom value co-worker camaraderie. Moreover, some company traditions predictably turn tipsy, such as holiday parties or corporate retreats. Yet the discourse around drinking at work may be rapidly shifting. As corporate leaders confront sexual harassment in the workplace, many have opted to eliminate alcohol from company events entirely. Additionally, experts suggest that serving alcohol at company events can create other kinds of liability, from insurance issues to personal injury risk. How many professionals see alcohol as an essential part of company culture, and which industries are most likely to encourage drinking? 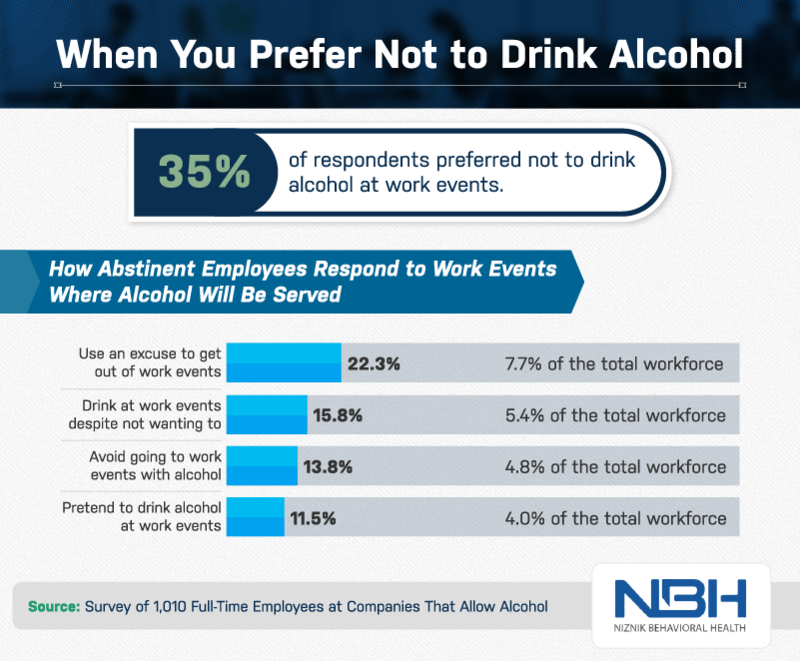 To find out, we surveyed more than 1,000 individuals about their experiences drinking or abstaining at company events. To learn how booze and business mix in workplaces across America, keep reading. Employees of tech companies were most likely to report that their employers permitted or sponsored alcohol consumption overall. This finding resonates with recent headlines emerging from Silicon Valley: Companies like Twitter and Glassdoor offer free beer at all hours, while other tech giants have moved to curb partying by changing previously lax policies. Other top industries included construction and marketing and advertising (perhaps some concerning habits from the Don Draper era do linger). Professionals in arts, entertainment, and recreation were also quite likely to report drinking at company events or with colleagues, as were employees at IT and data processing companies. 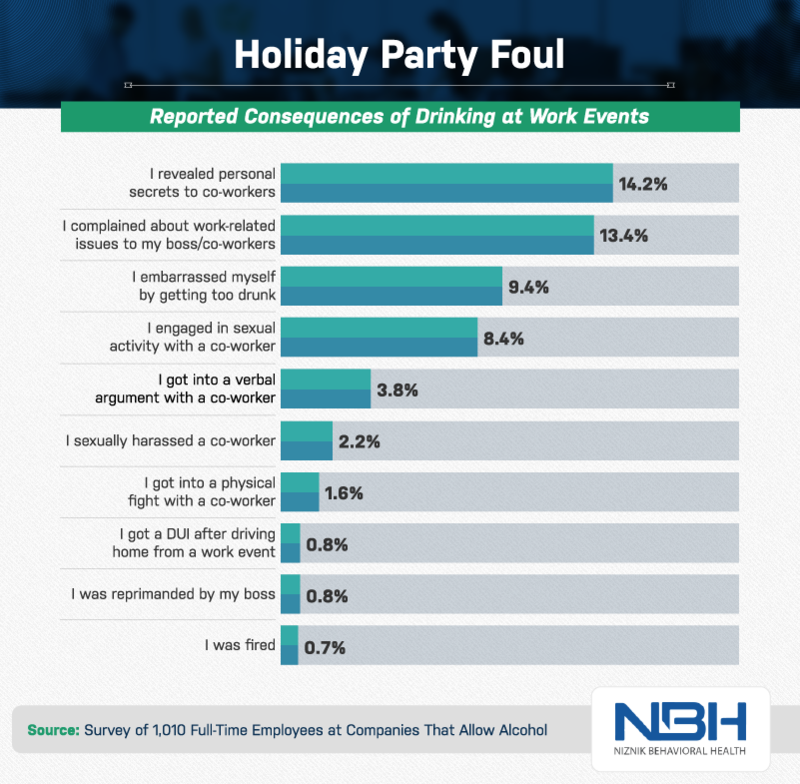 Merely 45 percent of respondents said their employer discouraged drinking at all company events. Holiday parties represented the most common form of sanctioned drinking – though companies are increasingly reconsidering the presence of alcohol at these events in light of concerns about sexual misconduct. Interestingly, however, workers in the legal field were most likely to report boozy holiday parties. Unfortunately, recent research suggests attorneys are particularly likely to struggle with substance use issues, and lawyers often view firm events as a chance to blow off steam relating to the stress of their profession. Sometimes alcohol availability seemed designed to fuel cohesion: Twenty-four percent of respondents reported that drinks were served at team bonding events. Government workers were most likely to recall booze being at a bonding event. Additionally, 13 percent of workers whose companies permitted alcohol use said their employers allowed drinking at lunch with clients and customers. In some cultures, drinking is even more integral to wooing clients: Researchers have found that Japanese professionals consider getting drunk an important ritual with prospective business partners. In technology, intoxication seemed to facilitate internal connections instead, with more than a third of tech workers reporting company-sponsored happy hours. Power differentials can complicate drinking with colleagues: Slurring your words in front of your supervisor is probably ill-advised. Indeed, while 78 percent of respondents said drinking with general co-workers was acceptable, just 60 percent viewed supervisors as suitable drinking partners. That trend continued up the corporate ladder: Fewer than 40 percent felt it was acceptable to drink with company owners or executives. While some experts suggest schmoozing with the boss can work wonders for one’s career, it seems boozing with the boss is another matter entirely. No matter your drinking partner’s job title, however, moderation is in order: With any kind of co-worker, our respondents felt two drinks was the appropriate amount of alcohol to consume. In a similar vein, beer and wine were seen as the most acceptable drinks to have alongside colleagues, whereas most respondents felt that various kinds of hard liquor were not a good idea in such scenarios. One reason for this perspective may be that it is difficult to gauge the strength of mixed drinks served at company events (or anywhere you aren’t mixing drinks yourself). Whether it’s eggnog or a communal punch bowl, it’s safest to steer clear of concoctions with ambiguous alcohol content. Not everyone looks forward to consuming alcohol at company events. In fact, more than a third of respondents preferred not to. Accordingly, the centrality of alcohol at work functions can prove problematic, especially for those who have struggled with alcohol use disorders in the past. 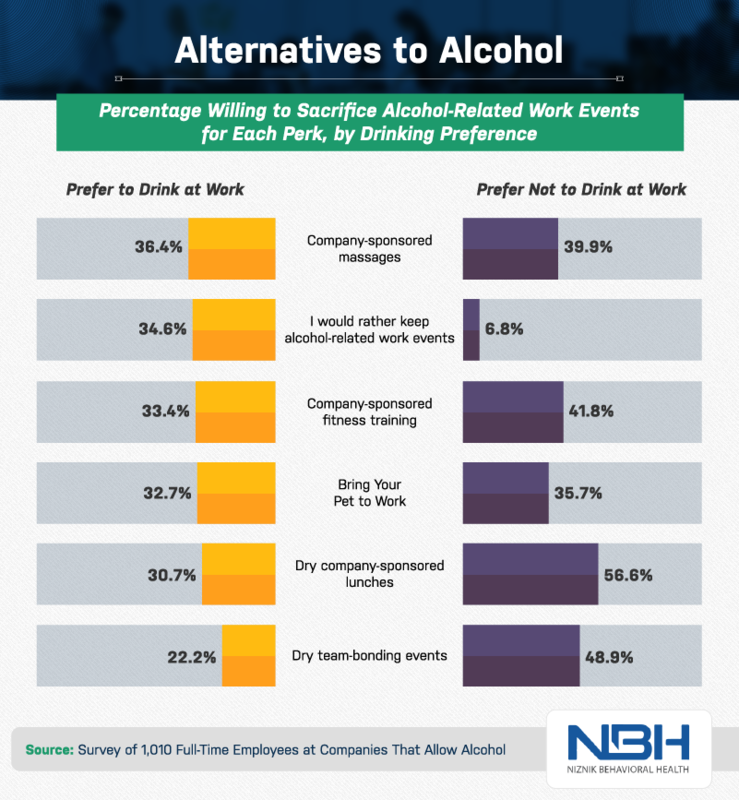 Among people who preferred not to drink at work events, 22 percent made excuses to get out of their obligation to attend. Another 14 percent simply avoided going. At some companies, however, failing to attend might raise questions regarding your commitment to the team. In that case, it might be wise to show up at such events occasionally, even if you decide to politely decline alcohol once you’re there. Some professionals, however, feel compelled to take part in drinking: Sixteen percent said they consumed alcohol at work events despite their preference to abstain. Others tried to mitigate perceived peer pressure to drink at work events with a little deception: Nearly 12 percent pretended to drink. While this move may seem unnecessary to some, experts say that keeping a nonalcoholic beverage in hand may be a wise choice for those in recovery. Well-intentioned colleagues are less likely to repeatedly offer you drinks if you have one already, and they probably won’t inquire if your cup contains alcohol. Professionals who preferred to drink at work events were more likely to feel they might benefit from doing so. In fact, nearly half of this cohort felt drinking with one’s boss and co-workers could strengthen those relationships. A smaller portion believed they would benefit directly from drinking with their bosses: Twenty-four percent said drinking with a superior could lead to better job opportunities. But attempting to ingratiate oneself with the boss takes energy and can even lead to resentment over time. Multiple studies suggest that those who attempt to climb the corporate ladder by socializing sometimes perform poorly in other aspects of their work – and badmouth their superiors behind their back. For others, fear of judgment drove drinking and attendance at events where alcohol was served. Among people who liked to drink at work functions, more than a quarter felt pressure to drink when their co-workers were consuming alcohol. An even greater percentage worried they’d be judged for not attending work events, and many who did not like to drink at such gatherings felt the same. These anxieties may be justified: As companies increasingly emphasize cohesion, skipping functions may create the impression you’re not a team player. Heavy drinking can lead to regrettable disclosures, and work events were no exception to this trend. Respondents were most likely to report revealing secrets to colleagues after drinking at a work event or complaining about work issues in a way they later regretted. Another 9 percent simply said they embarrassed themselves by becoming clearly intoxicated. In such cases, some would propose a proactive approach: Rather than waiting for others to broach the subject, express your mortification and move on. Sexual encounters were also somewhat common: Eight percent said they’d engaged in some kind of sexual activity with someone at work. These encounters are particularly likely to occur at holiday parties, with some research suggesting that nearly a third of co-workers who become romantically involved kiss for the first time at these events. Unfortunately, 2.2 percent admitted to crossing a line with their advances and sexually harassing a co-worker. Consequences, however, were quite rare: Fewer than 1 percent said they’d been reprimanded or fired as a result of their behavior. If some companies view alcohol-centric events as an important treat for employees, could more wholesome perks serve the same purpose? Logically, those who preferred not to drink at work events were more favorable to trade-offs of this kind. In fact, 57 percent of this group said they’d opt for dry lunches instead, and another 49 percent preferred dry team bonding events of any kind. Even more might be amenable to non-drinking team events if companies got creative: While many professionals dread trust falls and icebreakers, alternatives like game days and scavenger hunts might actually create enthusiasm. Interestingly, though, dry activities also appealed to a significant portion of people who liked to drink at work events. At least 30 percent of this group would trade drinking events for sponsored lunches, massages, fitness training, and permission to bring pets to work. Some commentators suggest holistic benefits of this kind are little more than a trap, enticements designed to keep employees attached to their work to an unhealthy degree. But for drinkers and nondrinkers alike, each of these options might yield more lasting benefits than an open bar. Our findings suggest that alcohol is a common feature of work events, and many professionals find its presence unobjectionable – or even an appreciated perk. Yet truly bonding with one’s colleagues means respectfully considering their needs and accommodating a range of preferences. If your company provides alcohol at its events, it’s important to convey that drinking isn’t compulsory. Moreover, moderation must be clearly encouraged, so that everyone can enjoy safety and comfort. After all, it’s possible for some employees to enjoy alcohol responsibly without alienating others. For those struggling with substance use, however, professional and personal consequences may mount quickly. If you or a loved one needs help, the time for meaningful change is now. Niznik Behavioral Health treatment facilities offer compassionate care of excellent quality with services personalized to your needs. Speak with our team today to learn how we can help you access the care you deserve. We surveyed 1,010 people using Amazon’s Mechanical Turk. 51.8 percent of our participants were men, and 48.2 percent were women. Participants ranged in age from 19 to 68 with a mean of 34.7 and a standard deviation of 9.2. Respondents were disqualified if they were not full-time employees or if they worked remotely. We used this group of respondents to create our first visualization, but any respondent whose company did not allow or sponsor any kind of event with alcohol being served was disqualified from the rest of the survey. 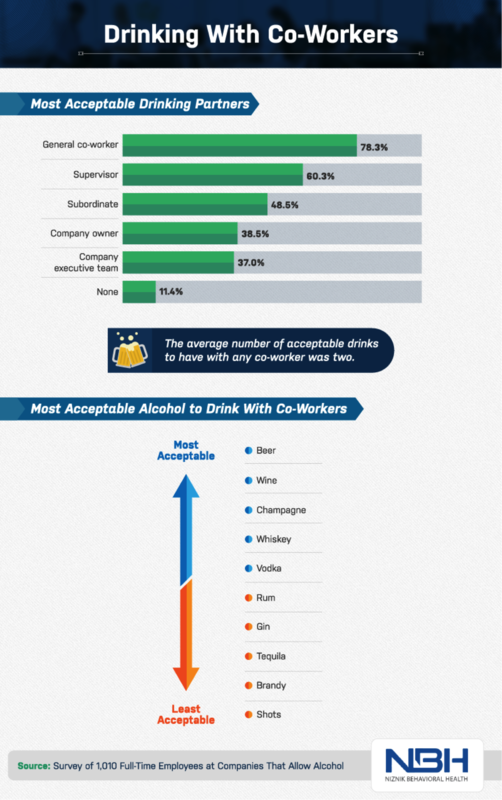 To find the top industries that allowed or supported drinking in the workplace, we created a meta-ranking. 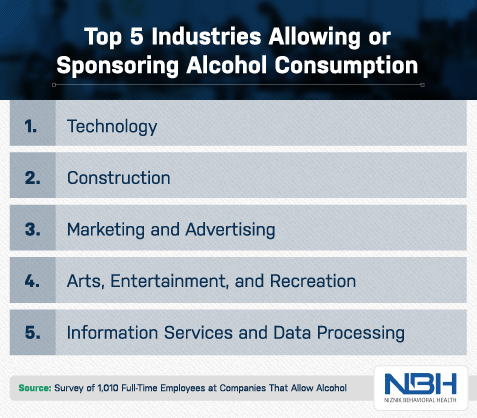 The top industries to offer each type of alcohol-related perk were ranked and the results were combined to create the overall list we provided. When we looked at industries that offered alcohol-related perks, the percentages were based on industries that offered any type. It is possible that some percentages were high due to only a small number of companies in that industry allowing alcohol. 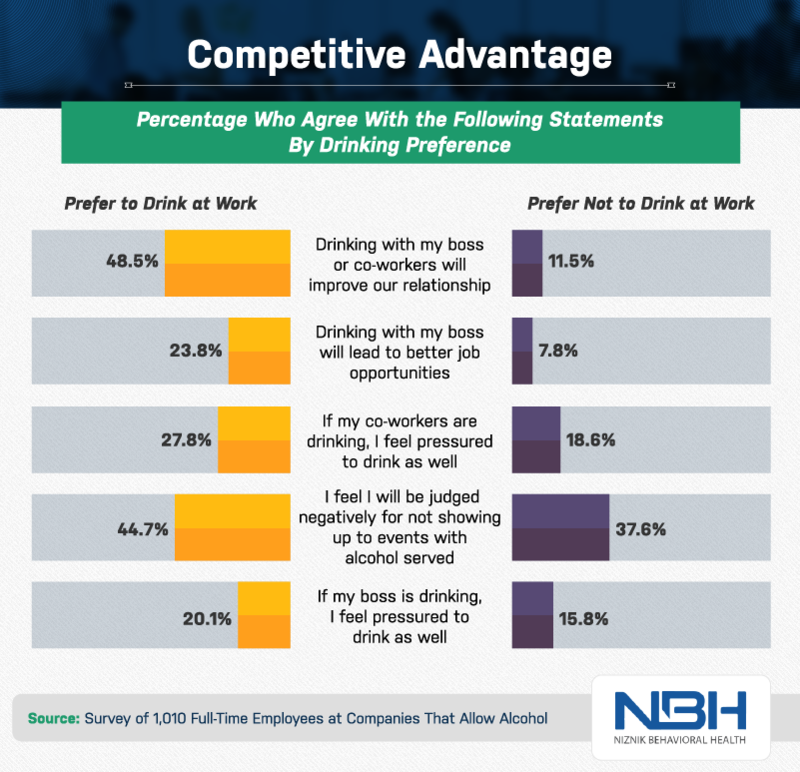 While our survey focused on employees who worked at companies that allow alcohol, some generalizations were made regarding the beliefs of the general population. Drinking at work events isn’t for everyone, and we hope you’ll help us raise awareness of the peer pressure that many professionals feel. Accordingly, we invite you to share this content with anyone who might be interested for noncommercial purposes. If you do use our images or findings, please include a link back to this page to attribute our team for our work.